Thank you for taking the time to get to know Puget Systems, America's #1 custom computer builder. The internet provides unique opportunities, but it also allows anyone to appear legitimate and credible. It is important to know and trust the online companies with whom you do business! This is a legitimate question, because there are many good choices out there. We are happy to be part of an industry with such healthy competition, and we are confident that even with the tough competition we are a clear leader in our field. We have an unwavering commitment to a high quality product line. This has become even more important in recent years, as more and more low quality items are hitting the market. The industry is being flooded with hyped products that do not perform as they should, and fierce competition is making it more important to be early to market than to put in proper development time. Through this chaotic process, the end user needs a skilled advocate to help identify true quality. Puget Systems is committed to be this advocate, as one of our core values. We have the experience to know when to be suspicious, and we have the resources to test products for ourselves. If a product stands up to our expectations, we still continue to evaluate it over time. We have the volume to be able to use statistical data to identify reliability trends over time, but we're also small enough to be very responsive to what we find. If a product does not cut it, we don't sell it. We want to make sure that you as a buyer are comfortable choosing from any of our options, knowing that if we sell it, we stand behind it. It is worth noting that this is not always easy. There are some very motivated manufacturers that do not share these values, that can mount considerable pressure. The answers aren't always black and white, and things like marketing funds, kick-backs, deep discounts, and shared advertising can make decisions very complicated. We know this is why some of our competitors are selling parts we would not. We are constantly self improving. Just as important to product line selection, is what we do with those products. We have carefully crafted each of our processes to generate self-feedback. Every support ticket opened, every RMA item, and every repaired computer is brought to the attention of all departments further up the line. We hold weekly feedback meetings, where every issue that needs it is discussed. It is very important to us that we not only set up firm feedback cycles, but that we establish clear lines of accountability. In our eyes, this is the best path to constant improvement. It has been amazing to see this in action. As time goes on, we solve problem after problem, making sure they do not have the possibility to happen again. And as each problem is solved, we can turn our attention to smaller problems. The cycle is never ending. We are available to you. We are proud of our transparency. Some of our competitors use tactics of providing as little detail about themselves as possible, to appear larger or more credible than they are. At Puget Systems, we are confident in ourselves and our abilities, and view it as a strength to share as much information about ourselves as we can. You can view our staff biographies by clicking on pictures on left hand side of this page, read our blog, or just give us a call or stop by! It has never made sense to us to hold anything back -- because PEOPLE are where the strength of any company comes from. This spirit of transparency carries over to all aspects of our business. This information helps you make more informed decisions, and it only strengthens us as well. We're excited to form a community with our customers. We have a proven track record. Talk is worth little unless you have proof. There are numerous resources you can use to make sure we are who we say we are. Start with our customer testimonials. You can also read our testimonials on Reseller Ratings, or read our media reviews. Or just Google our name...we're confident in the talk you'll find! Puget Sound Systems was founded by Jon Bach in December of 2000. 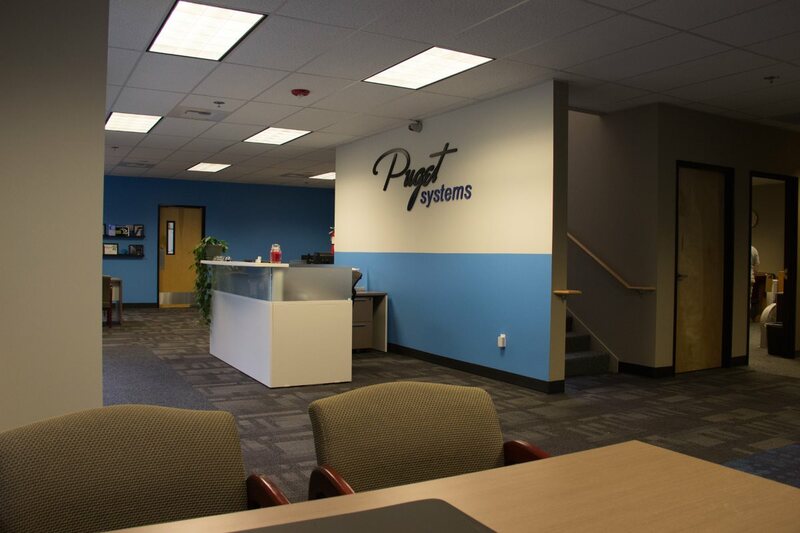 In 2003, we officially changed our name to Puget Systems because people unfamiliar with the company and the area were confused about whether we sold computers or audio systems! Originally run from Jon's home, the business started small and grew quickly. Over the next eight years, the company outgrew its location again and again. Each time, we moved to a larger and more ideal location. In January of 2009, we purchased an industrial warehouse in Auburn, WA. By designing the building interior from the ground up, we have been able to significantly improve the efficiency of our build process, and the thoroughness of our testing. Our new facility effectively doubled our usable space. Our current shared warehouse and office environment gives us nearly 14,000 square feet to work in. Roughly one third of our current space is dedicated to offices where we handle company administration and customer service. Inventory, shipping, production, and testing are located in the rear warehouse space. Entering our front door, you step into our offices. We maintain a relaxed, positive, and clean environment here at Puget Systems. Our assembly and testing space is no different! You are welcome to stop by anytime. Grab a cup of coffee, take a tour of our facility, and talk to us about how we can help you with your PC needs. Our philosophy is simple: Build a high quality product, offer outstanding support and your product will sell itself. This is a philosophy based on old fashioned integrity. It makes sense, and it works. Unfortunately, it has become a trend in the last decade for major computer companies to stop focusing on meeting the needs of their customers. Instead, many rely on flashy marketing techniques to make their lower quality systems look more appealing. Be careful when comparing their pricing to Puget Systems. Be sure not to fall for computer systems with misleading advertising and substandard parts! 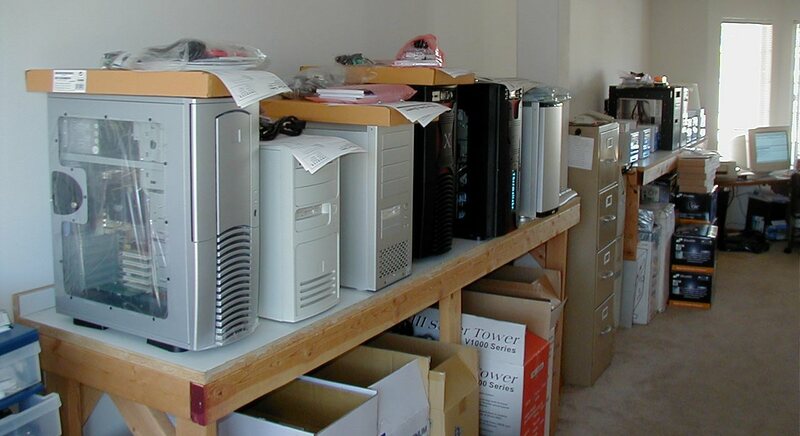 As a custom computer specialist, Puget Custom Computers was founded with the goal to break the trend of low quality, one-size-fits-all computers and to provide systems with superior performance and reliability. We have gone to great trouble to structure our business in such a way that our goals are, by necessity, the same as yours! Because we have a commitment to the complete support of your computer system, we save ourselves time and money by providing the computer system that is least likely to fail. Furthermore, we do not hire salesmen. We hire qualified technicians. The people you talk to before your purchase are qualified to build that same computer and give you support after your purchase. We have better things to do than hire a kid without computer experience to feed you canned answers. It all ties back to our philosophy that the best way to run a business is to focus on your product. Get rid of the hype, and focus on your goal -- quality computers! Our growth strategy is always changing as we learn and expand. With the kind of business philosophy we have, our growth strategy relies heavily on word of mouth. The most encouraging aspect of our strategy is that we know that it works - our growth rate is healthy and consistent. At our current growth rate, we double in size every few years. We are already far larger than the lifetime goal of our founder, and we are constantly updating our back-end systems and processes to scale to keep up. We take great pride in what we do, and we don't waste time with anything that detracts from our goals. For more information on who we are, or for a list of references, please contact us! We look forward to speaking with you. In 2005, Microsoft recorded a case study on Puget Systems, which they used at an internal function. It was a long time ago...we all look a lot younger! "The machine was exactly as I wanted it and the customer service was excellent. I shopped around before making my purchase and their customer service was the deciding factor when choosing where to buy my computer from. " The Puget website is unlike other builders' sites we've looked at in the past. Puget boasts a 'custom' configurator that offers every single component option the company has, which is very cool. When I actually started building my system, one of their Reps (Thanks Richard! ^_^ ) helped me every step of the way. Puget doesn't just deliver an expertly configured system built with care, they deliver peace of mind. From start to finish, they don't merely tell you they are doing a good job - they show you! They gave me great incites that resulted in a better build that was cheaper. The machine is beautifully quiet, solid, and FAST, all things needed for my occupation. I am delighted with this new computer. It functions smoothly and without a sound. What a relief it is not to have that constant buzz in the background when I am writing. The service was great and the customer reps were really patient and easy going, no hassle or sales pitches. Complete customization options! I will certainly consider buying here again, but it'll be a while, because they built me one awesome system! The shipping material ensures the product will withstand the abuse of the "I don't give a crap" delivery services and your product will arrive with a custom information binder that puts the rest of the industry to shame. Puget's attention to detail is worth noting here, too: in our idle power their towers occupy the entire top of the chart. Even their overclocked SLI rig, the Deluge Mini, idles lower than CyberPower's Gamer Xtreme 4000...with a single card. Once again, Puget Custom Computers has delivered an exceptionally quiet system - this time at a more reasonable price. As shipped, the system is as quiet as any system we've built on our own, and probably faster. It all built the expectation and anticipation that you were to receive something truly great. The nicest touches were the video, introducing me to the new computer and its many features, and the thermographic imagery, showing the low hear levels achieved. I get many compliments on the case mods and how clean the inside looks. They went above and beyond the whole way. And the build is top notch, quality components and nice custom touches like bracing on the GPU and CPU to prevent damage in shipping. Beginning the first time I visited the Puget website and began configuring possible systems, I received clear and well thought out emails from Puget representatives helping me with configuration options and offering suggestions. I personally enjoyed Puget's online status updates as your system is being built. You can follow the step-by-step process and they even post benchmarks and photos of your system online before it ships. We chose them exclusively because of their expertise, proactive effort, and class. They delivered from start to end. Puget Systems takes the time to ensure that each and every component in your computer is of the highest quality and will work harmoniously to bring you a trouble-free experience. Wonderful support and communication, quick service and a well built, thoroughly tested custom product.